Do you ever struggle with maintaining your emotions on an even keel? If so, did you know that commanding your soul will help you with this? I was feeling sorry for myself. I didn’t have any really good reason to feel sorry for myself, but you know how it goes. Well, I had my quiet time, but I was still feeling blue afterwards. I went about my morning routine, but I was thinking about how I knew it wasn’t right for me to feel that way. I knew self-pity is not from the Lord, and I knew I was giving in to a spirit of doubt and unbelief. I KNEW I had to snap out of it, but I didn’t feel like I could muster up the strength. My emotions were running away with me. As soon as I thought of this verse, it occurred to me that this is a very odd verse. This verse was written by David, the Psalmist and ancient King of Israel. The odd thing is that, in this verse, David is talking to himself! Even more specifically, he’s talking to a specific part of himself–his soul–and giving it orders! Your soul consists of your mind (intellect), will, and emotions. So in this verse, David is addressing his soul and telling it what to do. He’s telling his soul to bless the Lord. Uh, who knew you could order yourself around? And have you actually obey yourself? Why would you even bother to order yourself around–unless you are not already doing what you should be doing, and you know it? I have always thought of David as being a bastion of faith. I’ve never thought of him as being like me and feeling sorry for himself sometimes. But when David wrote this verse, his soul–his mind, will, and emotions–must have been misbehaving. His soul must have not been blessing the Lord, because otherwise, David wouldn’t have commanded his soul to START blessing the Lord. So back to my story. I was feeling all pitiful and pathetic. I noticed that David spoke to his own soul and commanded it to behave in a godly manner. I knew that my soul was created to be subordinate to my spirit, and I knew that my spirit is where the Holy Spirit lives. So I thought I’d try David’s method, and see if it would help me stop feeling sorry for myself. It was like my soul was a runaway puppy who came cowering back to his master. IMMEDIATELY I felt my mind, will, and emotions snap to attention and submit to my spirit, which is who I really am, and which is full of the Holy Spirit. IMMEDIATELY my soul was full of faith and hope again. Immediately I stopped feeling sorry for myself. I had finally found a solution… and I felt so much better that quickly! My soul is not who I am. My soul is merely something I have; something I possess. It’s something God created me with. But WHO I AM is determined by my spirit. So just like my outward possessions–my car, clothes, and kitchen utensils–don’t get to determine who I am, neither does my soul get to determine who I am. My spirit is in charge, and when I got saved, I turned my spirit over to the Holy Spirit. My spirit determines who I am, and “who I am” is that I am full of God. If you have made Jesus Christ the Lord of your life, then WHO YOU ARE is full of God too. So your soul–which is something you HAVE–has to submit to WHO YOU ARE. That means your soul has to line up with your spirit, which is full of the Holy Spirit, if you tell it to. So what are you waiting for? Are you feeling turmoil and unrest in your emotions today? If so, call your soul to attention! 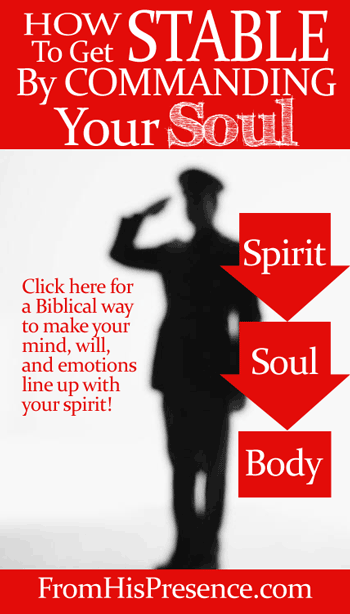 Command it, out loud, to line up with your spirit, which is full of the Holy Spirit! Commanding your soul will force your soul to do what it was made to do, and work for you, not against you. It has to obey. Commanding your soul. Huh. Apparently, King David was onto something. Were you feeling down when you started reading this? Did you command your soul as I described above? And if you did, did you feel it respond? Please leave a comment below and tell me about it! Wow, that’s really awesome, Michael! Praise God! Thanks for sharing your story with me! I’m SO glad! I went through a very difficult time and I couldnt understand why God let things happen as they have. But for days I heard this song in my heart that I knew of but didnt know it word for word. After a few days I thought I have to see why this song is in my heart, so I google it. The song is 10 000 reasons. The song is all about commanding your soul to get in line with your spirit and the Holy spirit in you. At firts I didnt feel like singing it because I didnt feel like singing that God is rich in love, thats how I felt. But I knew my soul has to submit to my spirit/ Holy Spirit even if I dont understsnd or feel like it. So I started to sing it, every day. I am a christian for many years, but never before did I feel the total different parts that’s part of me. Such a difference between my soul and spirit. I could feel that my spirit is save in God while my soul was in such turmoil. The first sunday we attended chur h after God told me this, the started the service with this song, saying that christians that have been excicuted sang the song walking to their death. Thanks for this awesome post!!! Wow, Aniena, that’s AMAZING. Thank you SO MUCH for sharing your story with me!!! I LOVE that song (10,000 Reasons)! God is so amazing to encourage you like that. May you continue to find strength in blessing the Lord–rain or shine! Have a wonderful day! Thank you for reading! 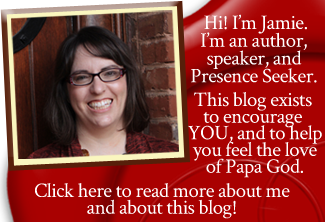 Your article has opened my eyes more..
Thank-you – very glad to have found your blog. This Word was so awesome!!! I have been struggling with anxiety getting the best of me when I have projects due or major events coming up. I hate the anxiety, as it seems to be out of control at that time. So your Word on commanding my soul to come in line with my spirit , which is full of the Holy Spirit, and bless the Lord, really ministers to me. Thank you so much!!!! Thanks Jamie, I have been reading psalms 103:1, trying to get a better understanding on commanding my soul to line up with my spirit which is full of the Holy Spirit. By reading your testimony gave me a better understanding. For a long time I have struggled so much with feeling like God didn’t love me (My mind knows full well He does. The cross proved that). Sometimes even reading a testimony of somebody else hearing from God that He was pleased or delighted in them would cause this intense emotional pain. It was really confusing to me because I had no reason to be feeling that kind of pain, and it almost seemed to be seperate from me. I wondered if it was possible for the enemy to be speak to our souls and not just our minds. The “why are you down, O my soul?” verse came to mind, so I started speaking to my own soul, telling it to quit listening to lies and accept God’s truth. It actually seemed to work. The pain went away! I have no idea how exactly this works but it is in the Bible and I suppose I’ll know pretty soon if it stuck.